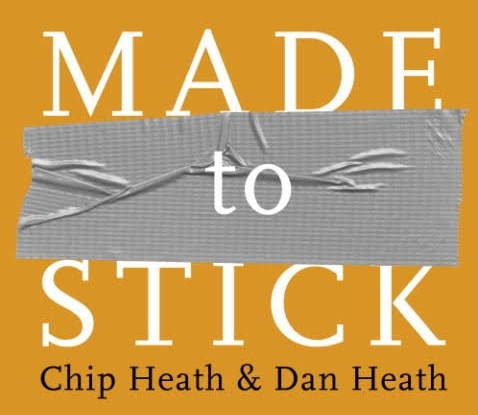 Made to Stick is a book that will transform the way you communicate ideas, create messages that last and messages that create change. By utilizing the six elements below in the SUCCESs model, you can achieve a greater connection with your audience. Your first step is to find the core idea – find the single most important thing but be careful not to bury the “lead”. Then, the key to motivating others with your ideas is to help them make decisions and relate to your idea by sharing the core. The author uses examples in the book such as Nordstrom, SW Airlines and Disney to show ways to “share the core” or use generative analogies. The six elements of the SUCCESs framework match up with a common communication framework. To communicate, you need people to Pay Attention (Unexpected), Understand and Remember It (Concrete), Agree/Believe (Credible), Care (Emotional), and Be Able To Act (Story). What’s next? Find your core idea and let the SUCCESs Model work for you. Here’s a link to a useful tool and SUCCESs model summary : http://heathbrothers.com/download/mts-made-to-stick-model.pdf.